Lipids (forms of fats), proteins, and sugars (longer chain carbs broken down) can be burned as fuel. That's called metabolism and is where you derive much of your energy. But what other functional roles do lipids, proteins, and sugars have in your body? Besides various lipids, like lipid layers surrounding every cell in your body, surrounding the nucleus, and surrounding the mitochondria (that, by the way, is a lot of good and important fat in your body, in every cell! ), proteins perform most of the physical cellular functions. Think of protein as (1) the cell's internal framework, (2) the motors, and (3) the main form of communication. In fact, I'm going to focus on proteins here because your DNA directly determines your proteins (if you change a DNA gene sequence [those A's, T's, G's, and C's], you change a protein made by your cell from that DNA gene). The (1) internal framework of a cell is simple to grasp and easy to see. Think of individual amino acids (20 different options) put together like blocks or LEGO's® to form what is called a protein forming a structural frame. 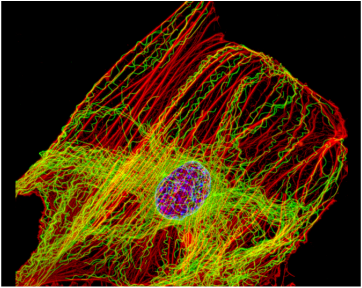 Like in this Fibroblast Cell picture (Note: most cell pictures you find are actin and/or microtubule staining similar to this one because this is cool and dramatic). Besides internal framework, proteins inside cells can also perform "reactions" analogous to (2) motors firing. These are usually called enzymes (yes, enzymes are proteins; even the ones that break-down proteins). These "motors" often take building blocks and connect them together (for example, making small lipids into large fat droplets / making small sugars into large carb chains / making small amino acids into large ﻿proteins﻿). Conversely, some other protein "motors" will actually break down the large molecules into smaller units. Some enzyme "motors" also generate your body's energy by further breaking down (often called "burning") proteins, lipids, or sugars. This is metabolism. So build up, break down, and...further break down. Simple enough. Proteins also do a significant amount of cell signalling, which is sometimes referred to as (3) cell communication, using molecules instead of words. For instance, if two cells are growing in a dish and they bump each other, proteins within the outer layers will (i) sense this contact (often by positive or negative charge changes), and (ii) the proteins communicate this contact by creating signalling molecules inside of the cell (that causes other, precise, reactions to occur inside the cell). Cell communication can be seen as incredibly complicated specific event but it can also be understood easily, just like you talking to another person. You can use specific words (which can be diverse and complicated) to describe highly specific things. But you mainly use words. You can only communicate so far (by yelling) before you are out of physical communication range. Your cells are similar. Cells just use protein-modified molecules instead of words. And the nervous system and your stream of flowing blood (and lymph) are your "cell phones" for long range communication. So proteins (3) communicate, they act as (2) motors, and they (1) form internal frameworks. This is the all important question. Originally, in your first cell (egg/sperm unity), proteins are already present within the egg (sounds like a chicken and egg situation, doesn't it?). These proteins are poised to perform basic functions, like communicate to the cell "divide now" or communicate "make more proteins now". Proteins originate and replenish from DNA code. It's called transcription and translation; that's how cells make proteins. Confusing words because they are so similar but they've stuck. Here's what it looks like. Now, of the approximately 3 Billion base pairs of DNA (A, T, G, or C), only about 20-25,000 are genes. 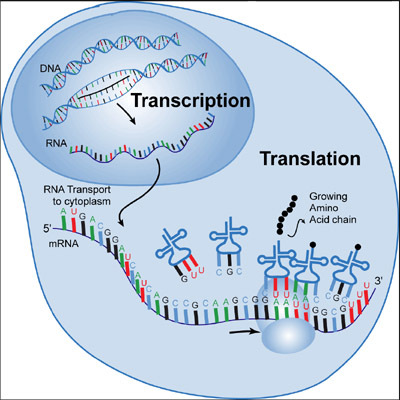 Genes are simply the sections of DNA that code for a protein (using transcription and translation as pictured). One gene averages about 1,300 base pairs (counting only exon regions), meaning that 1,300 base pairs x 20-25,000 total genes = 26-33 million base pairs are actually within your genes (the "code"), of the 3 billion total base pairs. How do scientists know approximately how many genes there are within those 3 billion base pairs? Well, genes cannot become "transcribed" into RNA (coded by proteins into RNA) unless proteins recognize and bind a "promoter" DNA sequence to start the process. This sequence varies between different genes but has similarities of code. These similarities allow scientists to identify how are present within human DNA and where a gene starts. Of course, there is also a "termination sequence" of DNA, that tells DNA-binding proteins to stop making RNA (keeping in mind that a region of DNA is first made into RNA, called messenger RNA, which is then made into a protein; transcription and then translation). So promoter DNA sequence similarities are how genes are first identified. What about RNA to protein? How does that happen? Translation is less intuitive but it can still be understood simply. Remembering that this is all going on inside a single cell and that amino acids (20 different types) need to be linked into a chain to form a protein, the process occurs on an enzyme called a ribosome that grasps onto the RNA and moves along the RNA as an amino acid chain grows. Little transfer RNA's (tRNA's) holding a single amino acid bind the ribosome IF they have the appropriate complementary sequence (C binds G and A binds U; RNA contains A,U, G, C, instead of the A, T, G, C code, which is confusing but just the way it is). In other words, tRNA's can add amino acids to a new protein if their "tails" match the RNA. See the picture below. This process results in the same protein (long chains of amino acid building blocks) being formed from the same gene as many times as the cell needs, based on signalling activation. In case you need detailed information, here is a chart of the actual code. So if the RNA strand has UUU where the ribosome is bound, the tRNA carrying a Phe (or phenylalanine) amino acid will bind and attach a Phe. Only the Phe-tRNA can bind, not the other tRNA's. You'll notice some redundancies but that's just the way it is. Scientists don't make the rules, they only discover them. How does this all relate to your life? Well, in summary, genes within your DNA lead to RNA being transcribed that lead to proteins being translated or created, inside every cell of your body. Since your DNA is the same throughout all the cells in your body, if you have a mutation in a gene, the protein coded by that gene may not fully function wherever it is made in your body. Knowing these gene mutations, or variations, and your specific proteins that might be changed by them, is important to understanding how your own body functions. It also will help you make changes that have positive results on your health and life.